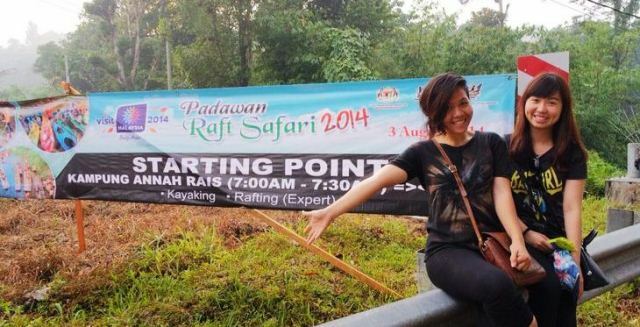 Two bloggers, namely Hilda Teo and Alyssa Jaren, took time to go on an all expense trip sponsored by the Sarawak Tourism Board to do rafting during the just ended Padawan Raft Safari 2014, held at the outskirts of Kuching. Held at the heartland of the Bidayuh community in Kuching, both Alyssa and Hilda were also given the chance to enjoy life at a traditional Bidayuh longhouse, with dinner featuring some very traditional Bidayuh food. Alyssa who flew in from Miri to join the trip said that she enjoyed the whole experience despite the fact that the water was not as dangerous as many may think. She also said that there were a few incidents where participants would fall into the water due to the unstable rafting, but everyone had a good laugh before actually helping them up. The young and upcoming blogger however added that she somewhat felt sad that many were not aware of the whole event but hoped that more people would try it out as it was really an experience one would not forget easily. Hilda, who flew in from Bintulu also concurred with Alyssa while admitting it was her first time rafting. She said that cruising through the rapids were really thrilling, although she also admitted to being able to feast herself with durians while she did the activities. Hilda continued to add that there was a fantastic sense of calmness despite the adrenaline rush, while adding that the scenery while she was rafting was something she trully enjoyed, describing it as ‘breathtaking’. Aside from the rafting challenge, the bloggers, who joined other media teams, were also treated to a visit to the Sarawak Museum, the Medan Niaga Satok, the Kek Lapis factory and Kuching’s very own Orchid Garden. The Padawan Raft Safari experience by these two bloggers is a long joint collaboration between Sarawak Bloggers and the Sarawak Tourism Board in which sees bloggers under the the Sarawak Bloggers enjoy tourism products made available in the lovely state. On behalf of Sarawak Bloggers, a huge thank you goes out to STB for yet another amazing opportunity. To read about Hilda’s experience head on to this link, while you can read Alyssa’s view here. For more infor on the Padawan Rafting Safari, check out this link. Photos courtesy of Alysa Jaren. Previous article[Travel] Second time in Phuket, yet it’s still awesome!